Combine the meatball ingredients in a large bowl, mixing well with your hands. Set aside. In the bowl of a large slow cooker, combine the kale, potato, carrots, broth and white wine. Roll the turkey into 1-inch balls and place carefully into the slow cooker (try not to let them touch!). Season the slow cooker with salt and pepper. When dinnertime rolls around, having something bubbling away and ready to eat is more than a blessing. It’s a downright relief. Slow Cooker Meatball Soup is a big favorite at my house. 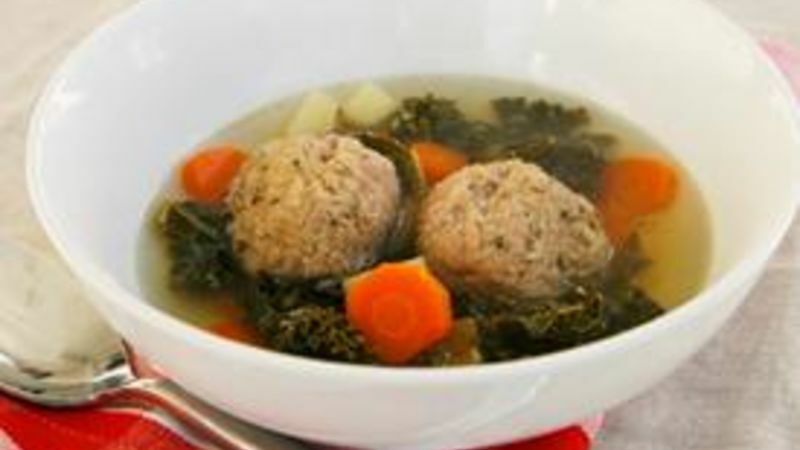 My husband and kids love the tender meatballs, flavorful broth and abundance of kale, potatoes and sweet carrots. I love that it takes about 15 minutes to toss together in the morning and is ready to serve in the evening. Don’t let the ingredients list scare you off. They're easy ingredients, and you can make it even easier with a few shortcuts (below) if you want to. To make flavorful meatballs, you need to have more than mere ground meat – it requires egg for binding, breadcrumbs for texture and Parmesan, salt and pepper for flavor. And it takes just a few minutes to form the one-inch balls for the soup. As for the rest of the ingredients, just mix ‘em in the slow cooker. Oh, and add those turkey meatballs that you just whipped up. Then you just turn on the slow cooker and let it do its magic – ‘cause, you know, slow cookers are totally magical. Skip the sliced carrots and use pre-shredded carrots. Use a small ice cream soup to scoop out the meatballs to speed up the meatball rolling. Or, if you’re super rushed, just purchase some frozen pre-cooked meatballs and call it a day. Look for pre-chopped kale in your grocery store. If you can’t find it and don’t feel like chopping, you can also just tear it into small bite-size pieces. Doesn't get much easier for a delicious, nutritious and soul-warming meal like this! Sarah W. Caron (aka scaron) loves the scent of a delicious dinner bubbling away in the slow cooker. She blogs about all things home cooking at Sarah’s Cucina Bella. Have you made any delicious soups in your slow cooker lately? What kind?